We invite you to the Mothpaper Opening Reception on Thursday, January 31, to unveil a temporary exhibition of large-scale photographic installations in an 1880's Victorian property, home to Space & Company at 2200 Walnut Street. Exhibition open through March 29th, by appointment. The reception is hosted by Michael Garden to benefit DesignPhiladelphia. Mothpaper offers architecturally scaled print installations. We are a platform for collaboration between artists, designers, and clients. Along with impacting interior environments through photographic and screenprinted installations, we also offer large scale printing services by appointment. The musician and multi-media artist, Daniel de Jesús creates artwork and music that is a fusion Baroque music and art, Mysticism, pop-culture, and the history of Puerto Rico and South America. Lindsay Browning is a Performing Dance Theater Artist based in Philadelphia, Pa. Since moving to Philadelphia she's had the opportunity to collaborate with many of Philadelphia's established companies as well as Independent artists including Group Motion Multimedia Dance Theater, Scrap Performance Group, Penn Dixie Productions, Susan Rethorst, Olive Prince Dance, Tania Issac Dance, The Opera Company of Philadelphia, and more. In addition to her work as a Performing Artist, Lindsay has developed a presence in the Philadelphia community as a Movement and Performance Photographer. Her work as a Visual Artist can be seen in several venues around the city including a Permanent Instillation in Rittenhouse Square’s Saxby's Cafe. For more information about her Photography visit www.lbrowningphotography.com. 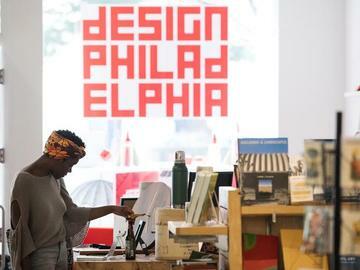 As the oldest design festival of its kind in the country, DesignPhiladelphia highlights the work of thousands of local designers, architects, and creative professionals to demonstrate Philadelphia’s reemergence as a 21st-century city shaped by thoughtful design, collaborative business practices, and community engagement. Over the course of ten days each October, places such as universities, cultural institutions, civic associations, city agencies, retailers, manufacturers, and startups across the city participate in over 100 engaging events including panel discussions, fashion shows, participatory workshops, studio tours, book signings, professional development classes, design exhibitions, and imaginative celebrations.